Chatnuchak market is only open on weekends. It opens early on Saturday and closes long after dark on Sunday. 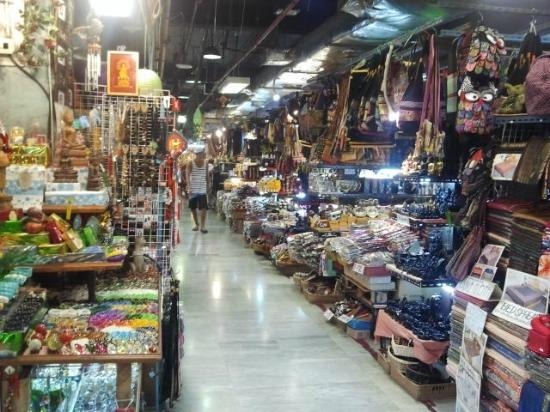 I’d heard that it was THE place to shop for all thing Thai and touristy, as well as oceans of other things from kitchenware, to pets, to plants. 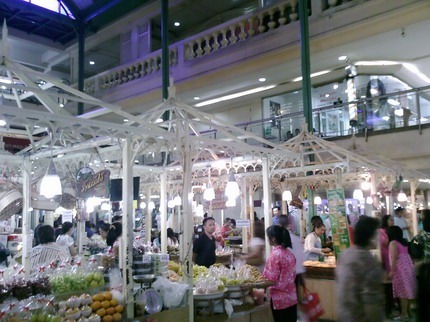 I had one day left in Bangkok and Robert was willing to come with me, so the market was the first stop on our agenda on Saturday morning. I also heard it gets extremely crowded, and if you read my earlier post on crowds in Bangkok, you’ll understand my feelings on the matter. In this instance going early to the market was clearly going to help. The question was how early? The opening time was sort of loose, depending on who you listened to or the article you read. I think we decided to leave for the market at 8am and see what it was like at that time of day. We ended up taking a taxi, although the BRT is very simple and takes you right to the door. When we arrived at 8.30am, the market was definitely open, not all stalls were up and running, but most of them were. It wasn’t crowded though, and it was still fun to look around. It totally recommend getting there early. Chatnuchak is HUGE! 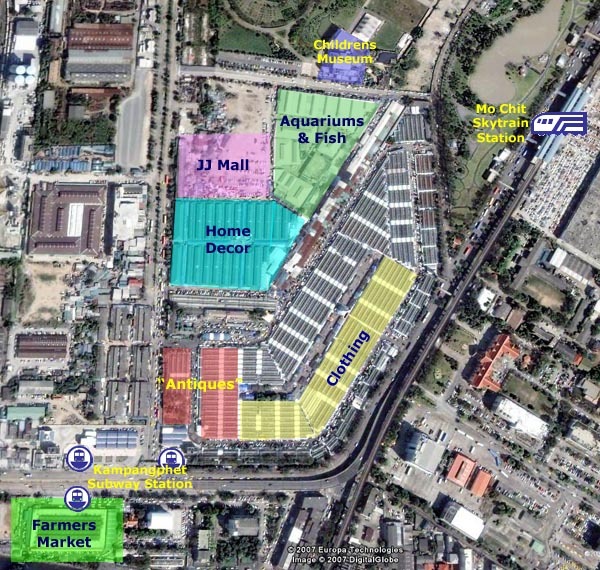 I think I read that it’s 30 acres somewhere, with claims of being the largest market in Asia. I’m not sure if that’s true or not, but it very believable. Its partially inside, under long covered aisles, and partially outside. Thousands of small stalls line the rows, and its very overwhelming. The experience is helped a little with the aid of a market map which is supplied from the information booths, and a numbering system which helps you navigate the different areas. 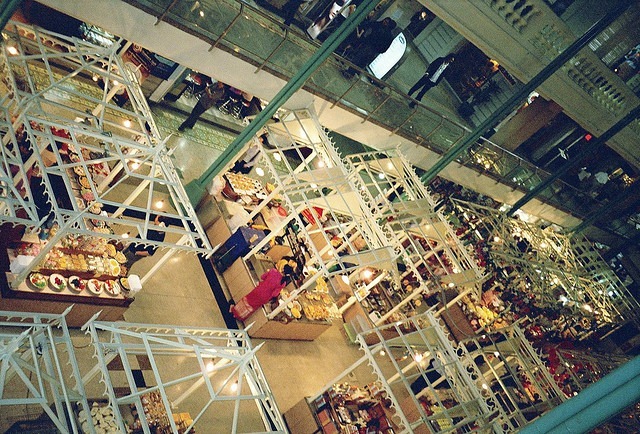 Stalls are grouped together by what they sell: household goods, clothing, shoes, pets etc. But it so easy to fall prey to “shiny object syndrome” and go off on a tangent and forget your original purpose. But who cares, right?! We wandered and shopped and wandered around some more. There was just so much to see. I had a bee in my bonnet about buying some cushion covers and I wanted something with the ubiquitous elephant motif on it. Touristy I know. But the Thai’s do it very well. Lots of elephant-inspired everything to choose from and I got a very pretty sequined elephant design cushion cover for about $8.00 and a few other bits and pieces. Robert was still looking for fabric. We never found any there, but we hardly looked very hard. There was too much stuff and too little resolve to keep going forever. We took a break for a cold drink and Robert’s feet were killing him. Opposite was a foot massage place. Perfect. He had a foot massage, and that bought me another half an hour of strolling and exploring. I could have kept going but didn’t want to push my luck, and the place was starting to get more full, so we jumped in cab and headed back to the hotel area for lunch. As we drove in a taxi on one of the major roads in the middle of the city, we noticed a stripe of orange in our peripheral vision. 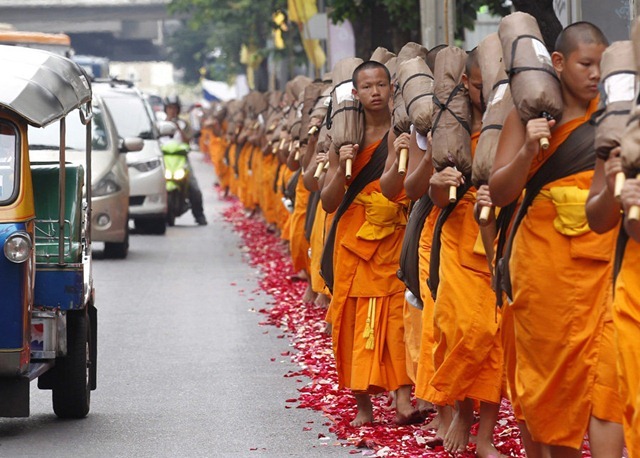 Turn out to be a few monks….no, a long line of monks….no, a really, really long line of monks. It took a while for the eyes and brain to register the enormity of it. There were over a thousand of them (I later learnt). Carrying only their sleeping mats, they walked barefooted on a path of flower petals, with devotees praying on the ground where they passed. It was the most extraordinary sight. When we got home I jumped on google and learnt that it was a devotional walk across Thailand from North to South. 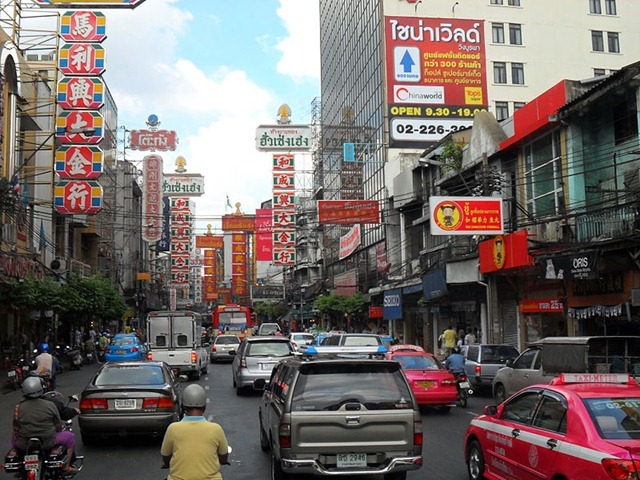 We just happened to be in Bangkok at the same time they passed through. Amazing! Our taxi was taking us down to the Chinatown and Indian areas of the city as my research for fabric suggested there was a lot to be found there. We got out a a department store that was known for its fabric shops and looked around a little. It was mostly everyday synthetics and cottons, nothing special, or uniquely Thai. This memory we had from twenty years ago, just seemed to be be out of date. We did stumble into the Old Siam Center, a shopping mall, for a look around. We entered at the ground floor amid the food court, which looked pretty clean and fresh, and sold some interesting looking stuff. The architecture and individual food stalls did have an old world feel to them. I don’t think the center was as old as it wanted to appear, but it also seemed to be built much earlier than many other shopping malls I’d see, and was, perhaps, a bit outdated. We wandered around for a bit. Looking down from the higher floors, the stall reminded me a little of Greenhills market, although more upmarket. This place also had a fabric area. Lots of beautiful silks and cottons. If I had been having a fancy dress made, it might have been the perfect place to buy the fabric, but I was really just shopping for fun, and nothing really jumped out at me. Also, at least 70% of the silks were sold by the yard in specific lengths with specific designs, lending themselves to making a traditional Thai skirt or dress. As pretty as all this was, this was still not we were looking for. The fabric hunt ended there. It wasn’t until I was at the airport and I saw some of the Jim Thompson designs did I realise that these were the fabrics that I wanted. But the $300 price tag for a scarf was not. Its nice to have something to look for as a way of exploring where you are, but the lesson is that things don’t always stay the same. If there is a next time for me and Bangkok, I might just make a point of going to the Jim Thompson Outlet, which this time around I’d decided was too far out of town. There was probably a great place to have some Indian food around there, but with no local to show us around or even a guide book, we decided to head back to the business area near our hotel and get some lunch. It was a great decision because the business area was quiet on a Saturday and the lunch period was coming to a close. We had a quiet Chinese lunch and headed back to the hotel. 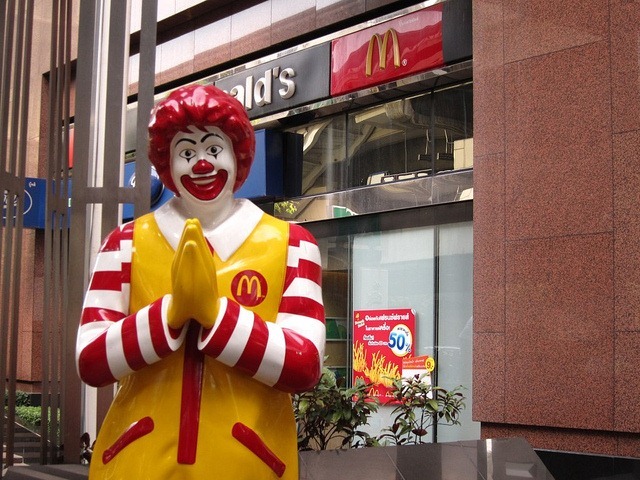 I can’t imagine eating in McDonald while you are here on a short visit, but I guess people do. I liked the traditional hand greeting though. Even taxi drivers bowed this way as the opened the car door. I had thought it was just for tourists! I enjoyed Bangkok and wish I’d had more time to explore the river or take a trip out of town. But it was fun to stay for a few days and experience a nice hotel. There may be other opportunities to come back as Thailand may prove to be a good R&R spot once we’ve moved to Nepal. Especially as its a landlocked country, we may be missing the sea a little! 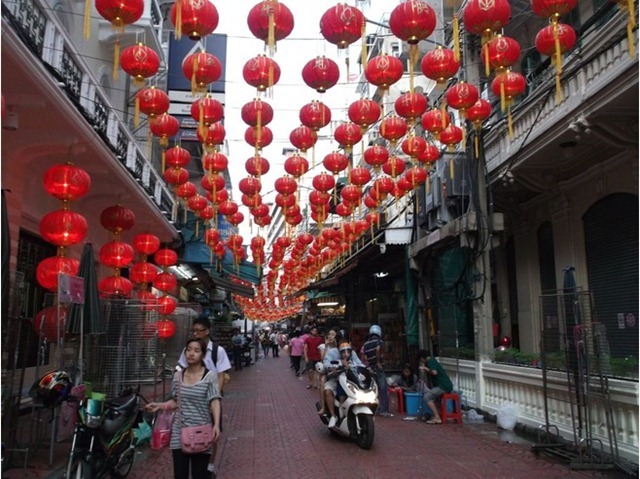 It was hard not to see Bangkok constantly through the filter of my experience of Manila, although I was aware that this approach wasn’t necessarily fair to either place. 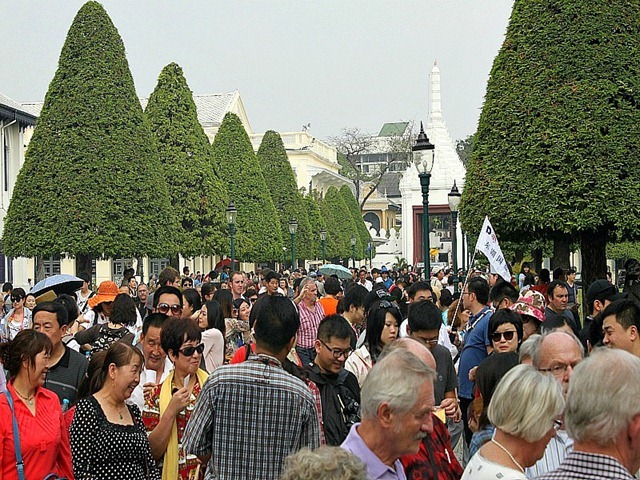 Thailand is definitely ahead on making itself welcoming to tourists, and I wonder if in ten years time, Manila would have developed to this point. I guess time will tell. Having shopped as much as I could the day before, my plan was to get a little cultural sightseeing into the mix during my second day alone in the city. 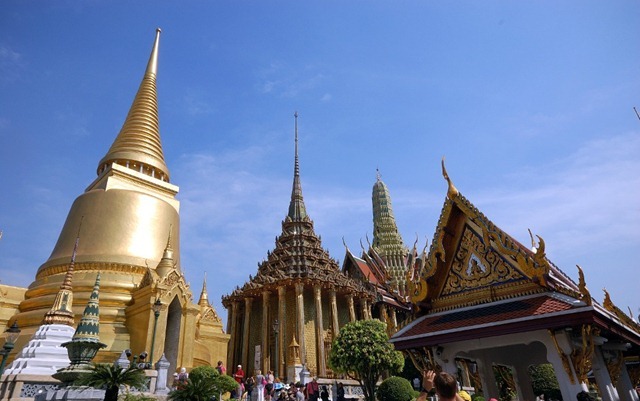 The number one to-do on everyone’s list seemed to be going to the Grand Palace. However, after a little research I learnt that it gets incredibly packed and was full of horror stories involving dumb tourists being scammed left and right. I wasn’t afraid of the scammers, but the crowds were a whole different matter. I have to admit that morning I almost rolled over and gave up on going, as the thought of being jammed packed anywhere with a zillion tourists was turning me away. But I pulled out some resolve, decided that if it was too crowded I could just leave, and an hour later I was in a taxi heading over to the site. I arrived just as it was opening. And boy, the net did not lie. It was packed…crammed…with tourists as far as the eye could see. The picture below doesn’t even begin to do the crowds justice. Take this crowd and add in about 20 giant bus loads of school kids, and you have every inch of every space taken with milling people, just standing around waiting for instruction. They weren’t even queuing up for anything. I jumped up on the little wall on the edge of wide entrance area, and wove my way through the trees to the ticket office. I’m suspicious that it was school bus season, with kids visiting just before the end of the Thai school year, pushing the crowds way beyond tolerable. However, paying for a ticket was easy, because it looks like I was one of about 5 people who hadn’t come in a massive group. In fact, showing up by yourself in these types of situations is actually easier than trying to do it with someone else. It was so crowded, it was hard to deftly weave in and out of the crowd, but it would have been much harder with more than one person. Oh, and did I mention that there was a dress code? Its all over the net, but a little vague at the same time. Women aren’t allowed to show legs, toes, or armpits. It seemed stricter than the Greek Orthodox monasteries and I didn’t want to hassle with the rented outfits. So I wore light shorts with long light pants on top, and a sleeveless tank with a light sweater on top. The idea was that I could strip off the top layer at the first opportunity. It was already 95 degrees. These people are insane! Walking around I noticed a lot of women wearing knee-length skirts and plenty of naked toes in sandals. I took my sweater off in protest. Like anyone was going to notice in this mob scene! Entering every structure looked like a 30 minute commitment, so I avoided it. Instead I concentrated on getting up close and personal with some of the amazing detail work on the outside on the buildings. Every inch of every building was covered in something ornate and wildly decorative. Figures, patterns, gold, jewels, glass, tiles…it was all there and pretty amazing. So I asked the driver to keep going. 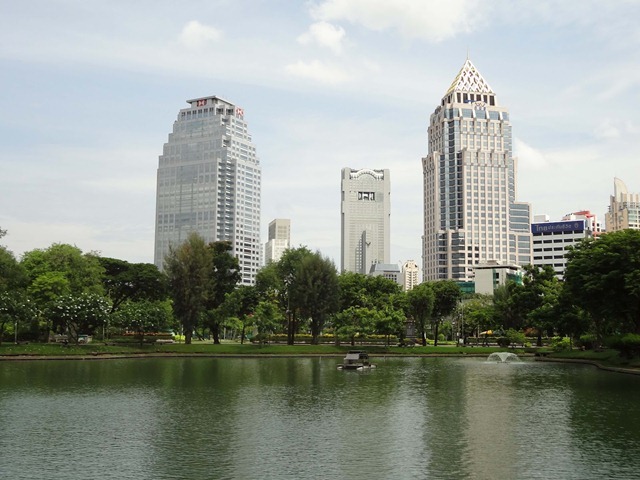 Lumpini Park was on my list of places to go and I was hoping it would be peaceful and quiet. And 20 minutes later, we arrived at the far side of the park and, wonderfully, it was almost empty. I went from heaving crowds to this little quiet space right in the middle of the city. 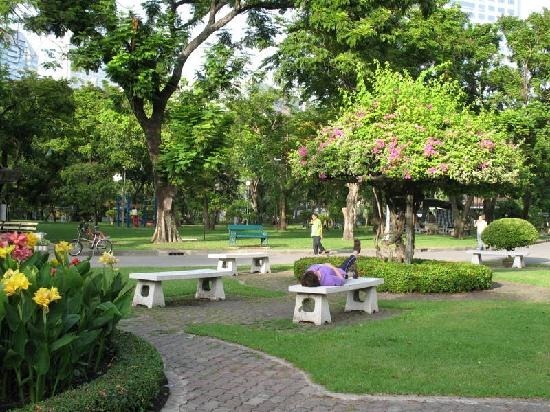 Manila really has no parks of any kind, and the few “conceptual” parks that we have in The Fort are really just pedestrian walkways with a few plants. This was space, greenery, and a lake. 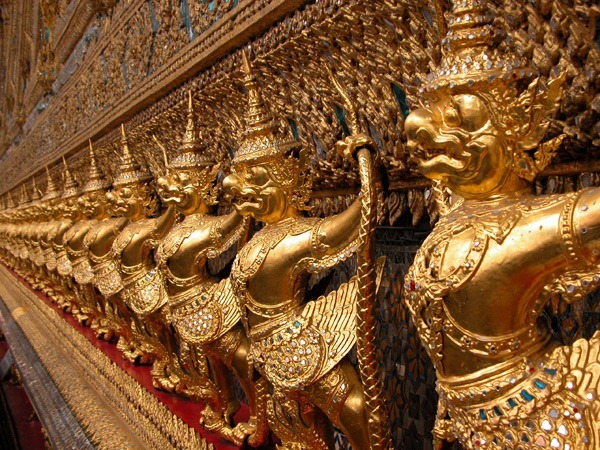 A much welcome antidote to the Grand Palace. I walked around a little. There was an outside gym area with guys working out, a few cyclists, dog walkers and small children. It was reasonably maintained, but a little shabby around the edges, but basically a very nice place. A quiet oasis in the middle of the city. After a while I found a wrought iron bench and sat down for a while and watched the world go by. After about 15 minutes, with no warning, a big monitor lizard appeared at the edge of the water and slipped out of the lake on to the bank. He then waddled around through the park, taking his time and ignoring me and everyone else. He just hung out, scratching around in the dirt for something. I watched him for ages. It was my second time meeting monitor lizards, the last time being at the underground river in Palawan. I’m glad I recognized what this was. I’d have been more frightened if I didn’t know! After the park, I slowly headed back to the hotel on foot, exploring a little more of the downtown area and grabbing something to eat. I was glad I got to see the Palace, despite the crowds and my lack of Thai historical background, which would have helped to put in some sort of context. I had one more day left in Bangkok, and tomorrow I wouldn’t have to explore alone. Chatnuchuk market here I come! 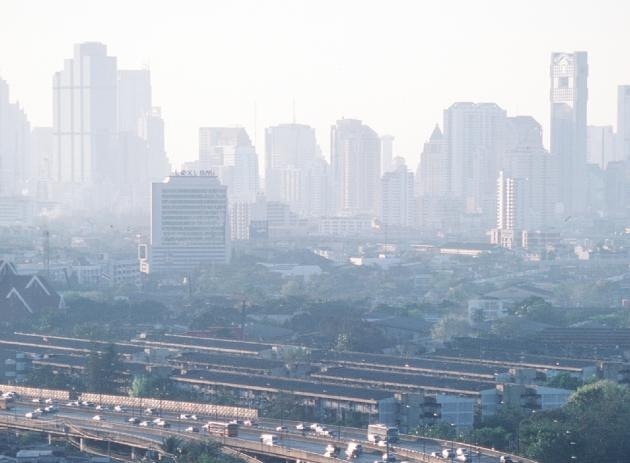 First impressions of Bangkok was not what I expected: more smog and more humidity than Manila. A lethal combination that the weather service was blaming on the continuing cool front over the city. Cool being a relative word, of course. It certainly didn’t feel cool to me, and I live in a hot, humid city. The taxi driver experience was more coordinated than Manila, though I missed the lack of at least some English. The ride there in traffic was pretty good and the modern highway delivered me without any fuss to the Plaza Athenee Hotel in the centre of Bangkok for a 4 day visit. I was piggy backing off Robert’s stay there on a required training course and I would have 3.5 days to explore the city, but 2.5 days of that would be alone. Suddenly I was in a different Asia, minus the English or even the Latin alphabet. All around were pretty squiggly alphabet letters that gave me no clue – no clue – to what I was reading. I hadn’t experienced that since China. A little foretaste of life in Nepal, I think. Our hotel location was wonderfully close to a lot of the big shopping areas: MBK Center, Siam Center, and Central Chitlom Department store. The Metro ran from just around the corner to stops all over the city, but I decided that at least for now, I wanted to walk, and it was all walkable. So I set out the next morning to find out what they had to offer and was struck by impression number two: street food. Which fresh veggies would you like to top off your dish? 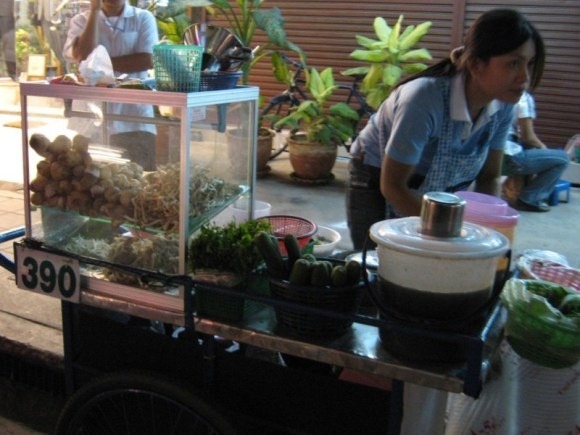 Most people have heard about street food in Bangkok. Even the Embassy doctor told me it was safe to eat, but in Manila you sort of disregard street food as not yummy and walk on by. Not so here. Everything looked good: fresh fish, fresh vegetables (yes, that’s fresh and vegetables in the same sentence), fresh fruit, fruit drinks, unidentified deep fried things on sticks… all of it looked good. 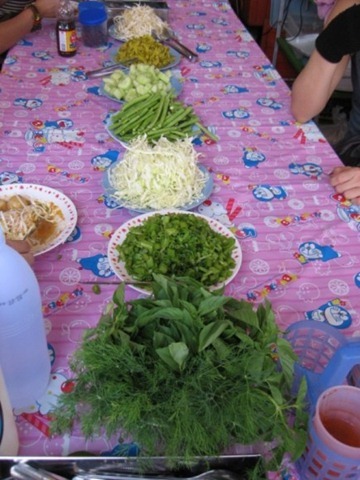 On the little plastic chairs and tables on the side of the road were bunches of fresh basil, grated vegetables, leaves of lettuce…because adding something fresh and crunchy to your food is a good thing here….! See…I knew I wasn’t making it up! I was kept visually entertained the whole walk to the MBK center just by eyeing the various food offerings. The walk is made easier to by a pedestrian skyway which runs about a mile along the length, and pedestrian bridges are located at most major intersections in the central part of town. You need to be able to go up and down stairs, of course but, if that’s not an issue, they beat fighting across the road at the lights. 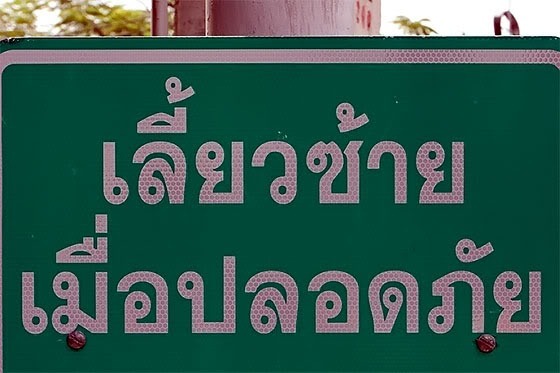 It turns out that Thai’s don’t respect the STOP! hand signal that I’ve used to cross streets here in Manila where a mixture of confident commitment and that hand signal stops traffic that has otherwise rebelliously ignored street signs such as cross walks and stop signs. In Bangkok, not so much. You WILL get mowed down! So on to the actual shopping bit. My target was the MBK center as it had lots of small stalls and sold knicknacks, souveniers and perhaps what I was really looking for….fabric. Asia’s known for it silks, batiks and cottons depending on where you are, but no so much in the Philippines. There’s fabric here, of course, but not much distinctively ethnic or interesting to buy. So I was on the hunt for some nice silk, preferably by the yard, not the most beautiful, expensive kind (sorry jim thompson) and not the really cheap Chinese stuff. Just something good quality and a reasonable price that I could use to copy some of my favourite shirts. 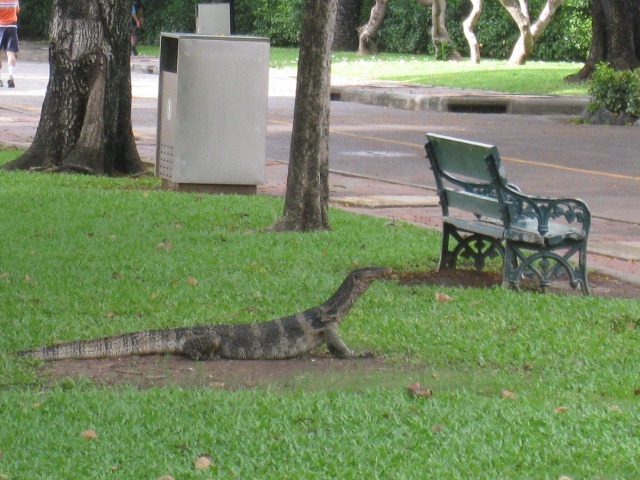 It turned out to be pretty illusive in downtown Bangkok. I’m sure it’s there somewhere but my first attempt failed in MBK and Chitholm Department Store which didn’t sell fabric. MBK was fun, though. Lots of the expected touristy stuff. A lot of it reminded me of the basketware, raffia and wooden items for sale in the Philippines. But it was fun looking around and I managed to find one or two things that I liked. I skipped the other malls. As a long weekend tourist, I really didn’t need any of the international retail chain stuff, although I understand department stores in Bangkok do sell western sized clothing. 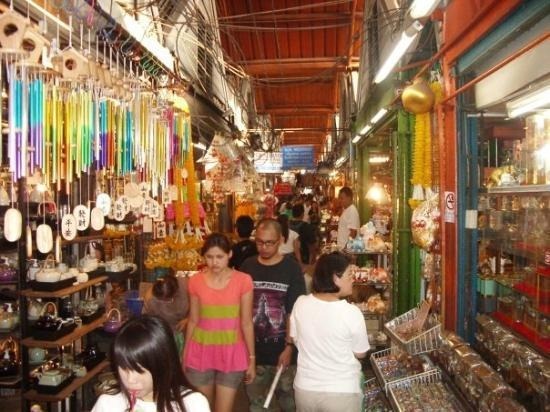 For now, I was saving my tourist dollars for the promised treasures at Chatuchak Market.